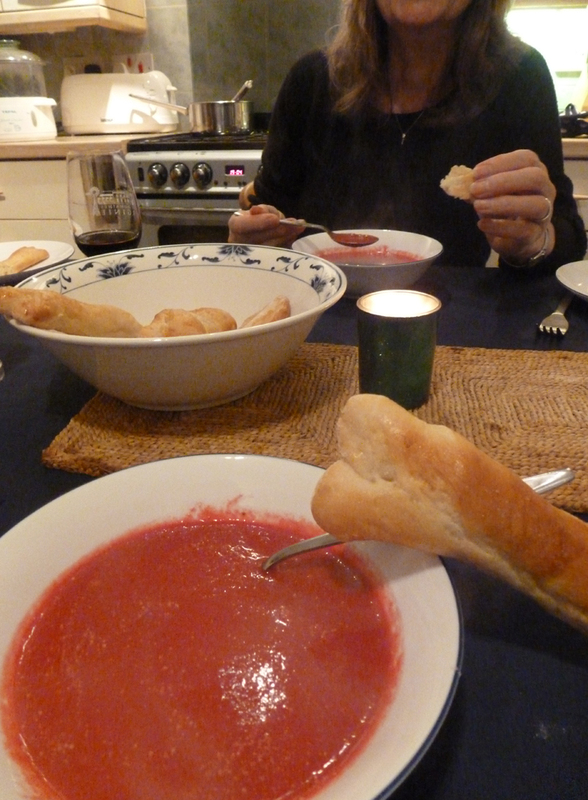 The soup is beetroot and horseradish, really! A great way to help consume a bumper crop of beetroot (like we had this year – big as footballs). We first tasted this combination at the Somerville Hotel, St Aubin, Jersey this summer, and just love the way the horseradish cuts through, and counterpoints, the sweet earthiness of the beet. Fry the onion gently until soft, not caramelised. Add the chopped, cooked beetroot. Add the chicken stock and seasoning. Simmer for 20 minutes or so. Allow to cool slightly, then blitz in a food processor/liquidiser. Add 2 tsp of horseradish, blend and taste. Tasting is really important with this. You want to add just enough horseradish to suit you, so you’ll find that you’ll probably add more, little by little, until you achieve just the right amount of pungency. Pour back into saucepan and bring up to near boiling point, then serve.